As glam rock debut albums go, you'll have to search a long way to find one that outclasses Suzi Quatro's opening shot. Though her fame and, of course, her hit singles-so-far were based around songwriters Nicky Chinn and Mike Chapman's guileless ability to crank out the classics, away from the glare of TV and radio play the pair allowed Quatro and partner Len Tuckey full rein. The result was an album of several very distinct parts, inextricably linked by the sheer power of the Quatro personality. The heart of Suzi Quatro lies in the band's choice of covers. Harking back to Quatro's years in Detroit clubland, there's a Slade-meets-Stonesy grind through "I Wanna Be Your Man," a raucous blast through "All Shook Up," and, restating the song's claim to be the best rock & roller any Briton ever wrote, Johnny Kidd's "Shaking All Over," garageland sexuality oozing out from every pore. Chinnichap's "Primitive Love," one of the finest songs that the duo ever left unnoticed on an LP, then echoes that same intent, seething percussion and unearthly crowd sounds building around a jungle chant that reduces Quatro's characteristic cries to a breathy growl that is pure animal seduction. Of Quatro/Tuckey's own contributions, "Glycerine Queen" (already familiar from a B-side) and "Shine My Machine" are the most in character, straightforward rockers bolstered by the band's already trademark roiling rhythm. "Skin Tight Skin," on the other hand, is the most adventurous, bucking the formula in favor of a slow swing and a vocal that is straight out of West Side Story. Since cherry-picked as the basis for any number of Quatro compilations, Suzi Quatro itself is best experienced either in its original form or across the 1988 Rock Til Ya Drop CD collection, which allies the LP in its entirety with five more period singles and B-sides (plus, inexplicably, two tracks dating from 1977-1978). 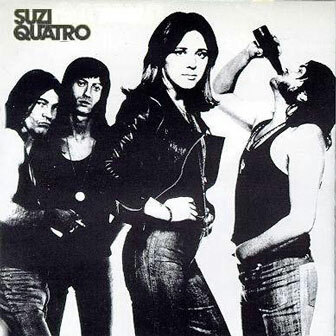 In either guise, Suzi Quatro remains one of the most nakedly sexual albums of the entire glam rock epoch — and one of the hottest debuts of the decade. — Dave Thompson. Well, bless my soul. What's wrong with me? Hey are you walkin' or stalkin?